If you have been thinking about building a retaining wall on your property there are many considerations for the project. While most retaining walls are created to correct erosion or drainage issues they can also be designed to enhance your property. Whatever your goals, think about these steps before bringing in the backhoe. What’s the Purpose of the Retaining Wall? Folks don’t just jump up one day and say, “Let’s build a retaining wall!” so that means there must be a reason for considering this project. Is there a drainage problem on the property? Do you want to create more viable space for your garden? Are you hoping to refine a steep slope structure by adding stairs? Maybe you want to add some dimension to your landscape. Whatever the reason, you can’t effectively start planning without establishing the purpose of the wall. And you certainly can’t start laying out a design without knowing the criteria. Before starting any home improvement project contact your local community for building code information. Most cities require permits and many will ask to review plans before construction begins. If you’re thinking about skipping this step, please don’t. Constructing something that doesn’t meet code could mean you would have to tear it out and start over. Yikes. That would be an awful waste of time and money. Anytime you are disrupting the soil on your property, it’s imperative that you have utility companies locate underground cables before digging. This is a safety issue. Puncturing a gas line or striking an electric cable could result in personal harm or property destruction. Always put safety first. Since the retaining wall will be holding back soil, it’s very important to know what type of soil you will be dealing with. Granular soil with a consistency more like sand allows for good water drainage and would be appropriate for building on. Clay soil is very compact and can put lots of pressure on walls. If the location of the retaining wall does not have the proper soil, you may need to haul in a more suitable product. If in doubt, work with a local landscape designer to ensure the structural well-being of the retaining wall. Rich organic matter should be used to top off the soil once the wall is in place. This will make a more hospitable environment for planting flowers and shrubs. Since heavy water flow is one of the main reason people build retaining walls, you need to make sure your design addresses proper water management. If this isn’t handled correctly, the excessive moisture can lead to retaining wall failure. You need to consider surface run-off and drainage within the wall. This is where a landscape professional can be very useful in contributing to your design and construction. Reviewing your purpose for building a retaining wall along with the landscape of the yard and the drainage will guide you to the proper location and indicate how high each wall should be. This will also determine whether you should construct a gravity wall or a reinforced wall. You will need to consider slope, setback and surcharges of the property. The angle of your retaining wall in the soil is the setback. The weight of swimming pools, fountains, patios and driveways are instances of surcharges. Gravity walls are just as they sound – they rely on their own weight and setback. When gravity will not be enough, than a reinforced wall will offer the proper stability and durability. While retaining walls are typically built for function, that should not mean they can’t be creative and lovely. Ban the railroad ties! There are so many terrific materials available today to aid in creating a design that is appealing and adds interest to your landscape. Think about adding curves to the design to create a softer appearance. Look at different textures and color available in block and stone. Consider a tiered approach rather than just a vertical structure. Check out the gabion style which is a design that incorporates metal frames filled with rock or wood. They are beautiful. 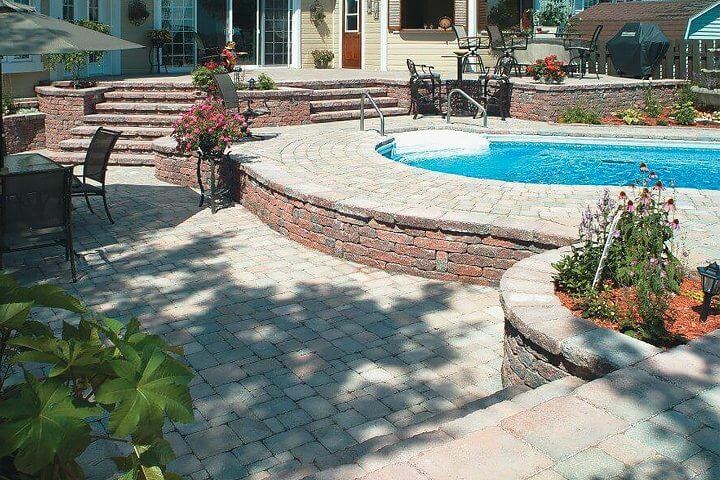 Planning your retaining wall will take considerable thought. Hopefully this recap of considerations will jump start your design plans and help get your project rolling. Keep your eye on the prize because when the wall is complete, you will be very proud of the result of all that hard work.